two new diamond signet rings in fourteen karat yellow, white, or rose gold. click on ring to visit in the store. square ear-studs in polished fourteen karat yellow, white or rose gold. with friction style posts and ear-backs. R.E.M. is a band that I have loved since I was a kid and still find their music in heavy rotation while at my workbench. So I love this hilarious R.E.M retrospective podcast hosted by Comedy Bang Bang’s Scott Aukerman and actor Adam Scott (Step Brothers, The Good Place, Parks and Recreation, Big Little Lies…etc.) Together they’ve gone through R.E.M’s extensive discography with many, many, many hysterical side-stories peppered in. They also have a great roster of funny guest…today’s was R.E.M. bassist Mike Mills. If you’re a fan, they also host a U2 podcast that is a must-listen, as well. I’ve listened to every episode at least once…highly recommended! brand-spanking new ear-hoops are now available in polished fourteen karat white, yellow, and rose gold. many size options from which to choose. 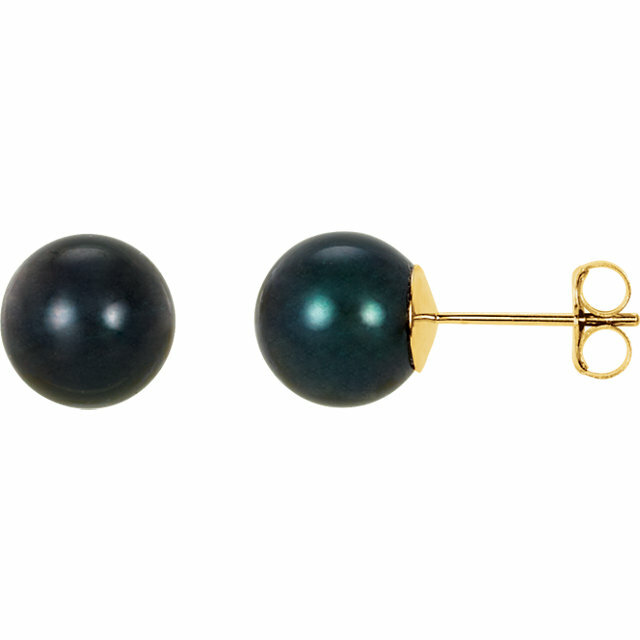 new Akoya black pearl earstuds! You guessed it...I’ve also just added brand spanking new lustrous black Akoya pearl ear-studs set in fourteen karat white or yellow gold. Available in five sizes. shop Akoya black pearl ear-studs now!!! If your are a fan of all things science…this is the podcast for you. New York’s WNYC public radio hosts Jad Abumrad and Robert Krulwich never disappoint with this fantastically interesting podcast/live show. I have religiously listened to every episode for (I cannot remember how many) years. Every single one is a diamond…perfect. I will not recommend an episode, they are all super-informative and super-engrossing. Take a deep-dive into their extensive archive and you will surely want to subscribe to their weekly feed. If you’re unfamiliar with KEXP it’s the super-cool Seattle Public radio station that specializes in current/retro indie and alternative music. They’ve got a deep roster of old-school-style Disc Jockeys (I picture a WKRP in Cincinnati-like cast…google-worthy) that actually program the station and choose the music that they play…a welcome revelation! Each have their individual tastes and personalities, so I recommend getting to know them all. I mainly stream the live feed during the during the day, but they have an extensive arsenal of great podcasts, shows of various genres and archived in-studio performances, as well. new diamond four prong basket ears-studs in fourteen karat white gold. Available in five total carat weights. You may know Paul Rust as a producer, writer, and central character on the Netflix show Love, and a bunch of other great stuff. And Matt Gourley is a member of the SuperEgo improv cast of characters and another thousand things including podcasts, TV and on and on and on. Google them yourself, I’ve got jewelry to make. If you’re a fan of comedy podcasts you know these guys. new diamond three prong ears-studs in fourteen karat white gold. Available in five total carat weights. I’m currently (I mean…come on!) listening to Minnesota public radio’s “The Current” when I need some early morning wake-up tunes. They always offer up an eclectic mix of classic indie/alternative favorites and some forgotten, by me, deep-dives into bands I love. I am hooked on the Saturday morning show “Teenage Kicks” which focuses in on the era from 70’s punk to 90’s grunge. Plenty of 80’s alternative…my guilty-pleasure decade genre favorite. Example…in the last half hour I’ve heard Nico Case, Pixies, Weezer, and Husker Du. They’ve got a great app to check out, as well. We’ve just added a “New Events” page to the circlesmith site. Check it out to see when we’ll be at the Sioux City Farmers market, when we’ll be having trunk shows, when we’ll be attending art shows, or when and where else circlesmith jewelry might pop up. Finally some blue sky! That cold winter grey was getting to be a little much. Looking forward to some Spring and Summer events…I’ll keep you posted. Wow…does Sioux City have a local Banksy?! That would be pretty cool. This definitely jazzes up my parking ramp. Just taking an afternoon break from my workbench and checking out more cool downtown architecture. I’ve got to remember to pay more attention! I’ve been seeing some pretty interesting design inspiration while walking around downtown. Join me Saturday, December 8th from 10:00-2:00 at ModHouse for a circlesmith jewelry trunkshow. I’ll have many handcrafted earrings, rings, bracelets, necklaces, pins & pendants from which to choose.